Most people regard judgment as something that occurs only at the end of the age. However, the Bible shows that Christians are being judged today. As in a human court, judgment is a process. Judges do not render decisions without getting the facts and pondering over all the evidence. Today, God is putting Christians through trials and tests to see if they will be faithful to Him and His way of life. Are you willing to follow Christ when it is difficult? Will you follow Him when it is dangerous? Will you follow Him if it causes pain, suffering and even death? It is so easy to become accustomed to the darkness. Has sin and darkness invaded your life? Is your conscience sensitive enough to recognize sin in your life and in your church? “This is the verdict: Light has come into the world, but people loved darkness instead of light because their deeds were evil” (John 3:19). Peter warns that a time is coming when Christians will be judged. By this, he is referring to severe persecutions which will test the faith of those being tried. Clearly, in such testing, not everyone is going to make it. Jesus warned that few would reach the goal. “Enter by the narrow gate; for wide is the gate and broad is the way that leads to destruction, and there are many who go in by it. Because narrow is the gate and difficult is the way which leads to life, and there are few who find it” (Matthew 7:13-14). Paul used the illustration of the Israelites leaving Egypt to make the same analogy (1 Corinthians 10:1-14). Millions of people left the idolatrous land of Egypt; yet, only two adults who left entered the Promised Land. Peter then asks; if it is this hard to reach the goal by people who want to go to heaven, what happens to the wicked and those who don’t care? The answer is that they will not make it to heaven. If judgment comes to God’s people here in this world at the hands of the wicked, what will become of the wicked when they face final judgment before the Almighty God? That is why we need to be constantly watchful: “Be sober, be vigilant; because your adversary the devil walks about like a roaring lion, seeking whom he may devour. Resist him, steadfast in the faith, knowing that the same sufferings are experienced by your brotherhood in the world” (1 Peter 5:8-9). And we need to: “be steadfast, immovable, always abounding in the work of the Lord, knowing that your labor is not in vain in the Lord” (1 Corinthians 15:58). If saints scarcely reach heaven, what becomes of the ungodly? What can they do who do not know God? What can they do who do not know the Savior? What can they do who do not have the Spirit of God? What can they do without prayer, the Word and the promise of God? 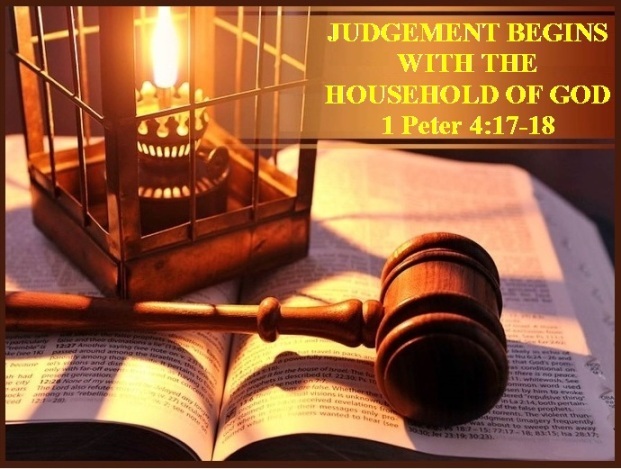 Judgment begins in the House of God, which means the church, and those that are playing around with sin need to stop before it is too late. Anyone who calls himself a minister of the gospel of Jesus Christ can’t embrace sin and allow sin in their church and expect that there won’t be any consequences. Our God is a holy and awesome God, and the only way that any of us are going to endure what is coming is to live in holiness. The Scriptures tell us that the fear of God is the beginning of wisdom, and there isn’t a lot of the fear of God in our churches today, but according to God’s Word, there will be soon. Excuses are being made for just about every form of sexual immorality that you can possibly imagine, and on top of that, many preachers are embracing the doctrine that nobody goes to hell. God cannot bless those who are unfaithful in their relationships with Him. People need to humble themselves while there is still time, but instead of becoming humble and repenting, they become aggressive and defend their behavior based on things contrary to the Word of God. Like the Old Testament says: “Woe to those who call evil good, and good evil; who substitute darkness for light and light for darkness; who substitute bitter for sweet and sweet for bitter!” (Isaiah 5:20). We live in a twisted world where sins have become rights, iniquities have become virtues and evil is considered personal freedom. There is a strong need for repentance and getting into a right relationship with the Lord. You are in great danger because you are not under God’s cover of protection. Don’t try to mix your faith in the Lord with other belief systems. Do not embrace social acceptance with immoral lifestyles. The patience of the Lord will end one day, repent now and ask God for forgiveness because, “if we confess our sins, He is faithful and just to forgive us our sins and to cleanse us from all unrighteousness” (1 John 1:9). We have a compassionate God, but He has limits. In Genesis 6 just before the flood, God said this, “My Spirit will not always strive with man. I won’t keep this up forever.” And then He drowned the entire world except eight people. The Lord was warning Israel, and God is still warning us, warning anyone who hears, not to go even close to the limits of God’s patience. If your heart is still at all sensitive to the gospel, if you are feeling the pull of God to believe in Jesus Christ, confess Him as Lord, turn from your sin, repent of your sin, and follow Him. If you are feeling that, then now is the day of salvation, 2 Corinthians 6:2, now is the time to believe because no one can guarantee how long you will be alive. Jesus said to them, ‘For a little while longer, the Light is among you. Walk while you have the Light, so that darkness will not overtake you; he who walks in the darkness does not know where he goes. While you have the Light, believe in the Light, so that you may become sons of Light’ (John 12:35-36). God is patient, but He has His limits. His Spirit will not always strive with you either, and because you will not believe, the day may come when you cannot believe. That’s a terrifying thought. Please think about this while there is still time.